Many aspects of the two new, hexagonal residential towers jointly designed by David Chipperfield Architects (DCA) and Karakusevic Carson Architects are unusual. Sprouting between the midcentury sprawl of oblong housing blocks in Hackney, their slender outline and hexagonal geometry stands out. At 20 and 16 storeys high, they resemble two oversized connector nuts among the beige, red and grey bricks of a giant’s upturned Legobox. Their name, Hoxton Press, has a different industrial reference however, connecting back to the 19th-century Mullord Brothers Printing Press that originally occupied the site. The towers’ conception and gestation is unusual: while collaboration is par for the course for Karakusevic Carson — 90% of whose work is public-sector residential and civic buildings — for the global, starchitect-y Chipperfield crew, not so much. Most refreshingly different, however, is the fact that these two developer-built, Hoxton Press towers, amounting to 198 nicely detailed, vista-strewn, market-rate apartments, have played a vital role in making possible the demolition of 400 unfit-for-purpose 1950s council homes on the troubled Colville Estate, to allow for double the number of replacement homes — yes, they are mixed tenure, but promise to accommodate all the original council tenants in one, direct decant. It is a welcome piece of clever, council- led regeneration that allows the local authority to do right by its existing and future tenants, while retaining ownership of and control of the land. 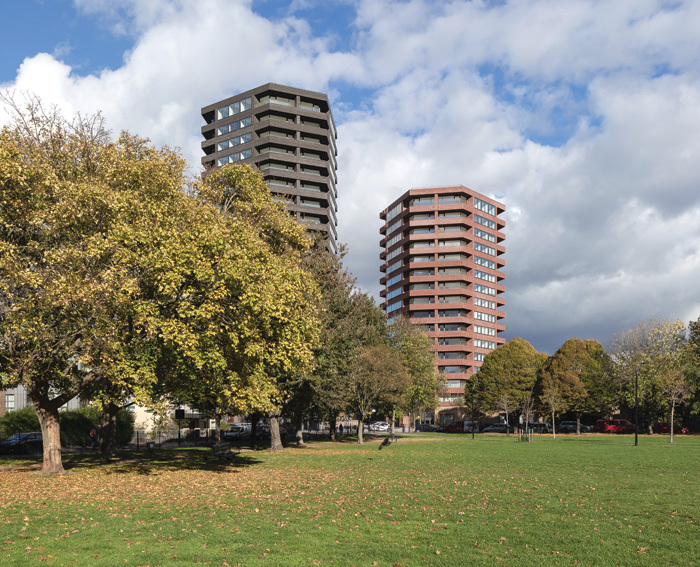 While the funding from the towers’ developer, Anthology, was critical, the company remains leaseholders on the land, with the council retaining freehold. This gives the council control over public realm and the neighbourhood’s present and future programming. Hackney has clearly harnessed Karakusevic Carson’s intelligence and experience with housing and masterplanning, and collaborated to facilitate a more cohesive, community-centric approach. Having found a small budget to start the redevelopment, Karakusevic Carson and the Hackney regeneration team developed a phased approach to the masterplan, and focused on how to proceed not just from a masterplanning, design and resident engagement perspective but also from that of high-level financial modelling. ‘The masterplan had to be viable at every stage with an overall budget of £300m,’ says Mannewitz. ‘Early studies highlighted that in this instance a refurbishment strategy would not be possible or popular with estate residents, and the preferred route was a phase-by-phase masterplan approach to the redevelopment of the whole estate.’ Each phase had to be broadly self-funding as a result of the financial crisis at the start of the masterplan process. Due to limits on council borrowing, a number of private sale and private rent buildings had to be designed that would raise money and cross-subsidise the rebuilding of the public housing. ‘We created a phased replacement homes strategy where new homes are provided for existing residents with each new phase, going from the original 438 homes to 925 in total,’ continues Mannewitz. ‘The residents’ choice was to live in low-to-medium-rise buildings, but this would not create a high enough density for a viable masterplan.’ So in early discussions it was decided that two taller buildings located mainly on the former estate car park and bin stores would be delivered for market sale to help pay for the lower-rise buildings across the wider site. ‘This decision was taken with the full support of the residents steering group and wider estate residents,’ says Mannewitz. ‘We have discussed with residents at each major design stage, from the outward appearance of the tall buildings to the design and specifications of the lower-rise buildings to ensure the homes built are aligned with their expectations.’ Having won planning permission for the whole scheme in 2012, then won the competitions to design the actual housing for phases one and two, Karakusevic Carson invited DCA to join them in pitching for the design of this third, most financially sensitive element — the towers — in order to bring the necessary starchitect allure for sales and marketing. So what are the new towers like? They are certainly handsome, assertive structures — the ‘first Sixties-looking brutalist buildings in Britain since the Sixties’, Chipperfield quipped on Instagram. The same Belgian brick (Van de Moortel) is used on both exteriors, but fired twice to become grey on the 20-storey tower. Colour-matched mortar intensifies the sculptural, solid quality. The bricks are laid in a stacked bond, using real bricks — rather than tiles — which are halved and then fixed into concrete. 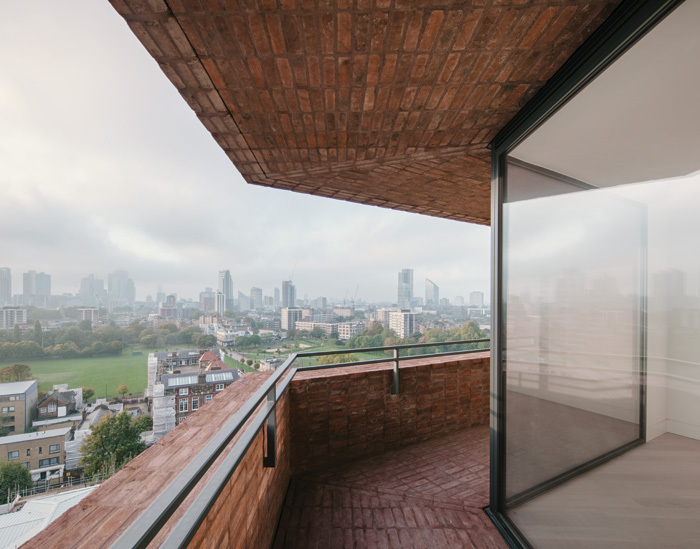 ‘It doesn’t pretend that it’s structural, but the brick gives it a bit of authenticity — makes it human scale, more approachable,’ says Mannewitz. 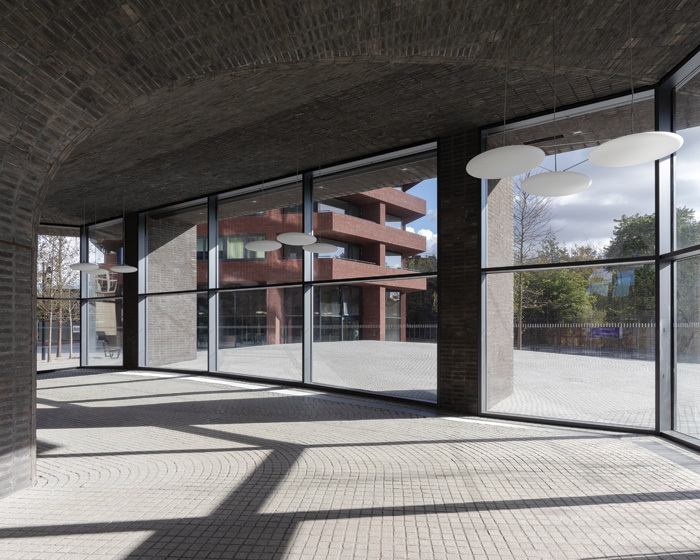 The impact of the towers at ground-floor level is reduced via double height, fully glazed lobbies, one of which is scheduled to house a community cafe. That car park now sits underneath the cobbled hillock, accessed via a sculptural ramp, also in grey cobbles, at the back of the red tower, providing parking for 39 cars and 210 bikes. Inside the towers, the plan is extremely simple: one- and two-bed apartments are arranged around a hexagonal core; three-bedroom penthouses at the top have their own roof terraces. Habitable rooms are placed around the perimeter for optimal daylighting and ventilation. 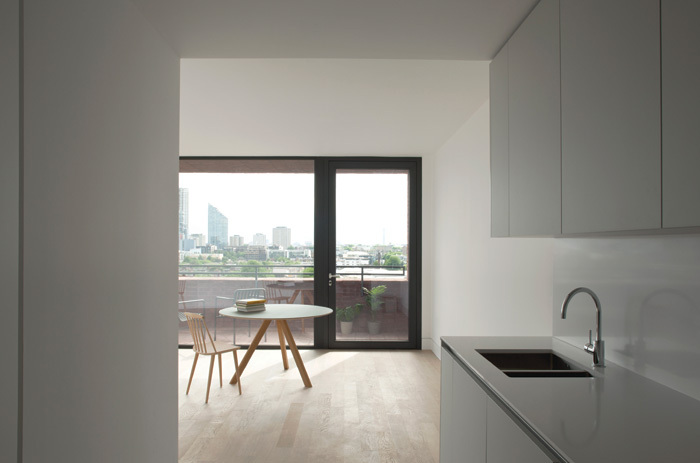 The faceted form provides dual aspect views for each apartment. And there are breathtakingly wide vistas from each large balcony that wraps around the living/dining spaces. As Field points out: ‘It is often the fact in these kinds of developments that the outside looks like an unfortunate consequence of whatever you had to put the greatest value on internally.’ But with this scheme, the structure, the envelope and the interior are really nicely resolved. 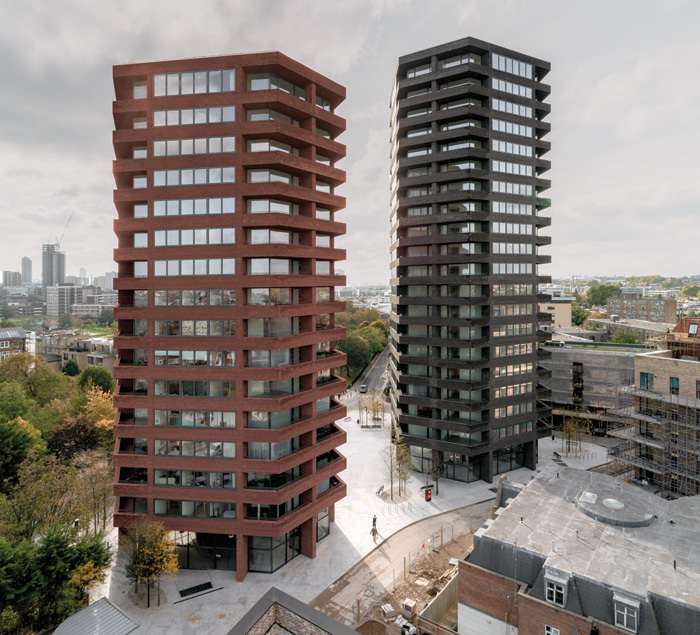 Although the scheme did not sell well off-plan (perhaps it takes the physical experience of being in these apartments to see the charm of the hexagonal layout), they have now sold 90 apartments, despite the housing market’s pre-Brexit wobble, and prices range from £700,000 to £2.95m. I can’t help but feel that, compared to the flowing and co-operative forms of these new low-rise developments, the towers seem fortress-like and introverted. Aside from the views, and the pleasure of occupying an inhabitable sculpture, I decide I would rather live down there. And that, surely, has to be a first: where the inhabitants of a scheme’s social housing can consider themselves better off than those in the luxury apartments that paid for them.